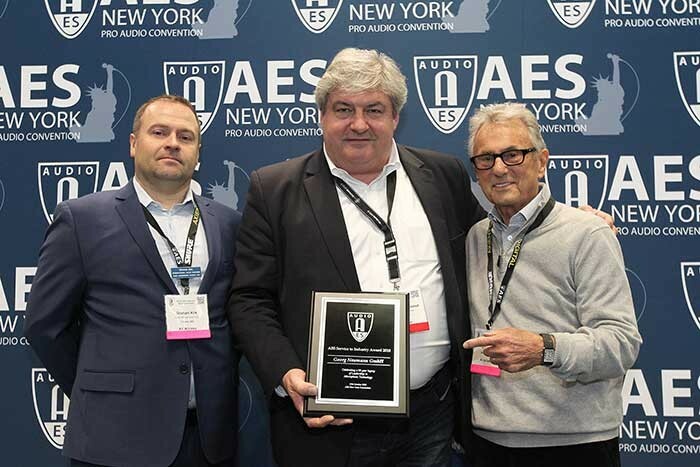 USA – During the AES 145th Pro Audio Convention recently held in New York City, Neumann Berlin was presented with a 90th Anniversary ‘Service to Industry’ award by the AES, which celebrated its own 70th anniversary in parallel. The award was presented to Neumann president Wolfgang Fraissinet during a special ceremony on Thursday, 16th October in celebration of the company’s standard-setting legacy of engineering prowess in the development of microphones for studio and live performance, and for Neumann’s advancement of microphone technology. During the exhibition, Neumann displayed many of innovations, both past and present. For instance, its limited-edition U 87 Rhodium Set and a re-issue of its famous U 67 microphone were at the stand, while more recent products on display included the Neumann Control app for iPad, which opens up the full potential of the KH 80 DSP studio monitor. Neumann Control, which utilises standard IP networking, allows users to define loudspeaker systems from mono to 3D audio set-ups, align them for a well-balanced in-room sound, and then operate them centrally. 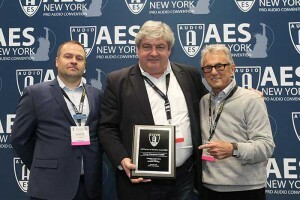 In picture: AES international sales director Graham Kirk (left) and multi-Grammy Award winning engineer/mixer Al Schmitt (right) present the award to Neumann president Wolfgang Fraissinet (centre).